Christmas has come early, huge discounts and savings are now available for all our fabulous regulars! As a spot of Aberdonian heritage, the Illicit Still loves to reward our lovely neighbours with the best deals around. This is why we have created our Locals Card. This card may appear small however it provides our customers with big benefits. Your Locals Card will entitle you to exclusive discounts. This includes a Pint of Tennent’, Manger’s, Small Glass of Wine, Jagerbomb, Caledonian Best and House Spirit & Mixer all for just £2.50 each. Yes, that’s two of these favourites for just a fiver – BARGAIN! On top of the unbeatable drinks deals, the Locals Card also entitles you to 20% off our delicious new food menu. Just flash your card and receive 20% off our new main menu which is packed full of goodies. Including hearty Scottish Stovies, our famous Haddock and Chips and of course a delectable Flat Iron Steak. These offers are available Monday-Sunday all day every day so no matter what the occasion you will be eligible for a discount on us! Still don’t have you’re discount card? Then what are you waiting for? 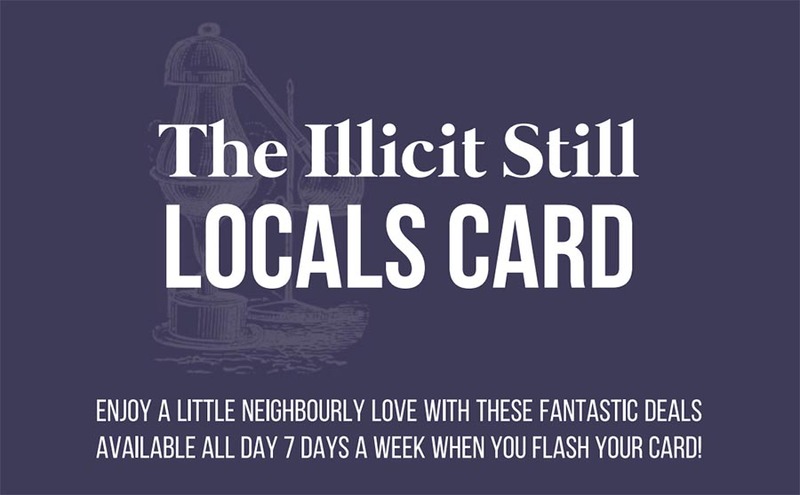 Pick up your locals card in Illicit Still today. Just ask your server for more details and they will be happy to issue you with your pass to unlimited savings. For more information visit our Facebook page or call us on 01224 623123.